Rarely does anyone find demons in the scriptures of the WTS that are very clearly recognizable. And even if there are very clear demonic embeddings in the Watchtower or the Awake, many viewers are still amazed and do not recognize them. This is the art of subliminal manipulation through images and graphics. 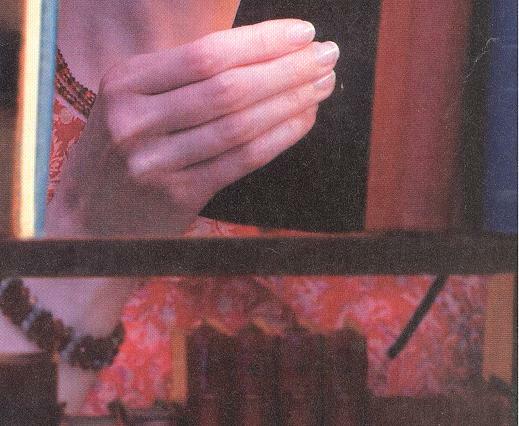 The manufacturer always hides them so skilfully that the viewer does not recognize them until the third or fourth look and even then can still have doubts about them. 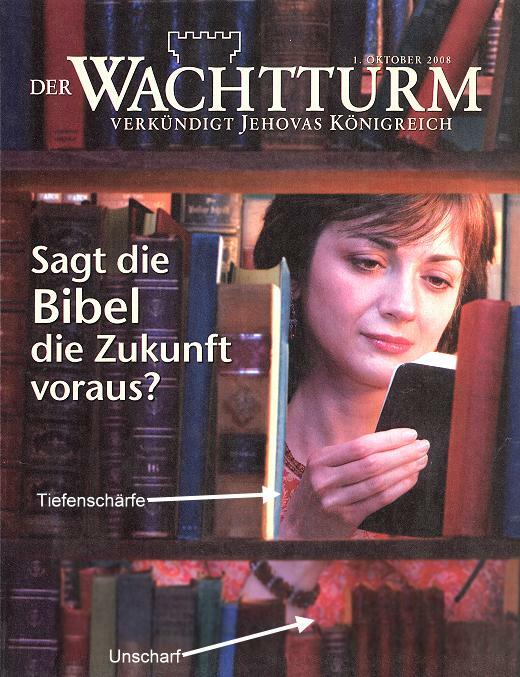 In the Watchtower of 1 October 2008, a woman stands behind a bookshelf and reads something. In the upper part her clothes are sharply depicted, but underneath a shelf her clothes appear cut off, blurred and diffuse. The Watchtower Society deliberately kept this lower area out of focus to prevent the demons from catching the eye too clearly. The artificial blurring of the lower area is conspicuous and immediately tells the connoisseur of faithful and intelligent slaves: demonic figures could hide there. Let's take a closer look at the blurred area. We can, when we turn the Watchtower of October 1, 2008 in the light, down right - in the deliberately blurred area - recognize a collection of "small funny aliens". There the pattern of the lady's "modest" outerwear gets into a small turmoil, which is only suitable to bring the Watchtower Demon among the people continuously. The question is: Does the WTS, often referred to by Jehovah's Witnesses as "their mother", take any particular pleasure in such manipulations, or is it obligated to its true God to repeatedly depict demons in its writings? Only the Governing Body of Jehovah's Witnesses can answer this question. There are even alleged critics of the Watchtower Society who classify all this just as chance and normal. Strangely enough, such web sites on the Internet are extremely well listed on Google and are mostly to be found in the top places. However, these pages are by no means intended to illuminate the truth about the Watchtower Society. Rather, like the Jehovah's Witness Governing Body, they themselves spread half-truths and ambiguities in the eyes of readers. The clearest and loudest outward proof that the Jehovah's Witness Governing Body can never be connected to God is its Theocratic Warlist teaching. To understand this self-exposure of the lying baron WTS, read: "Theocratic War List" by Jerry Bergman, Ph. D. and Mehmet Aslan.